Join us for an exciting day tour to Katmai National Park and famous Brooks Falls ! 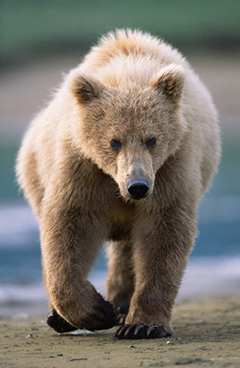 During the bear viewing tour, you can hope to see many grizzly bears catch salmon. It all happens at Katmai. Katmai National Park is located on the northeast coast of the Alaska Peninsula. Among all its diversity, the park boasts the largest grizzly bear population in Alaska with more than 2,000 protected brown bears. During the peak of the large sockeye salmon run each July, it is not uncommon to see around twenty bears congregate around Brooks Falls, and along the Brooks River, Naknek Lake, and the Brooks Lake shorelines. This is the perfect time for Alaska bear viewing. When on a grizzly bear tour, many visitors concentrate their activities along Brooks River, where brown bear congregate to feed on sockeye salmon as they pass upstream. Two Alaska bear viewing platforms are located right above the falls. Join the grizzly bear tour at Brooks Falls. Because it is one of the first streams in the region where bright, energetic, and pre-spawned salmon are available to bears, the Brooks River hosts one of the biggest grizzly bear and brown bear concentrations anywhere on Earth. The time of year along with salmon densities and spawning activity dictate when, where, and how the Alaska bear feeds along the river. Located in southwestern Alaska, Brooks Falls is one of the best places in the world for Alaska bear viewing and to observe brown bears. The bears and humans have been peacefully coexisting at Brooks Camp for over 30 years. There is three Alaska bear viewing stands set up for viewing the bears while they fish for salmon at the Brooks Waterfall. However, you commonly run into bears on the trails to the observing stands and campground. You might even witness a grizzly bear standing. When you go Alaska bear viewing, there is no need to fear. The bears have learned that they can trust humans in Katmai so they pretty much pay no attention to humans and simply go about their business of non-stop eating. The 3.6 million acre Katmai park has the largest grizzly bear concentration of protected brown bears in the world so you are bound to see them on the grizzly bear tour. Located next to the world-famous Brooks River in the heart of Katmai National Park is Brooks Lodge. You can use the lodge during the grizzly bear tour. Brooks Lodge, originally conceived as a fishing camp, has been in operation since 1950. Guest accommodations consist of sixteen modern cabins with showers, private toilet facilities, heat, and electricity. The comfortable cabins accommodate two to four people. The rustic main lodge building boasts a spectacular view of aquamarine Naknek Lake. Its large circular fireplace is a popular spot for relaxing evenings or to reminiscing about the day's adventures. There is also a restaurant with hearty Alaskan fare (buffet style), bar, convenience store, guide services, boat rental, and more. It’s not just a grizzly bear tour either. Besides brown bear, Katmai provides a protected home to moose, caribou, red fox, wolf, lynx, wolverine, river otter, mink, marten, weasel, porcupine, snowshoe hare, red squirrel, and beaver. We hope that gave you enough information about Alaska bear viewing. Bear viewing Alaska is a daring enterprise, but it is well worth it. Even if you don’t manage to see a grizzly bear standing, how many people can say they have seen a grizzly bear up close? The largest grizzly bear pack is waiting for you, and it’s time to explore your wild side. This is an opportunity you don’t want to miss, and you won’t leave barehanded. If you wish to participate in Alaska bear viewing, book your trip now. Don’t delay! Contact GoAlaskaTours for additional details.